Though I would consider myself someone who pretty much never got on the casserole bandwagon that is so popular with some folks... there IS something about a "one pot" meal that definitely appeals to me. I love soups beyond what some might consider normal. I think a frittata filled with a host of yummy veggies is borderline genius. And... 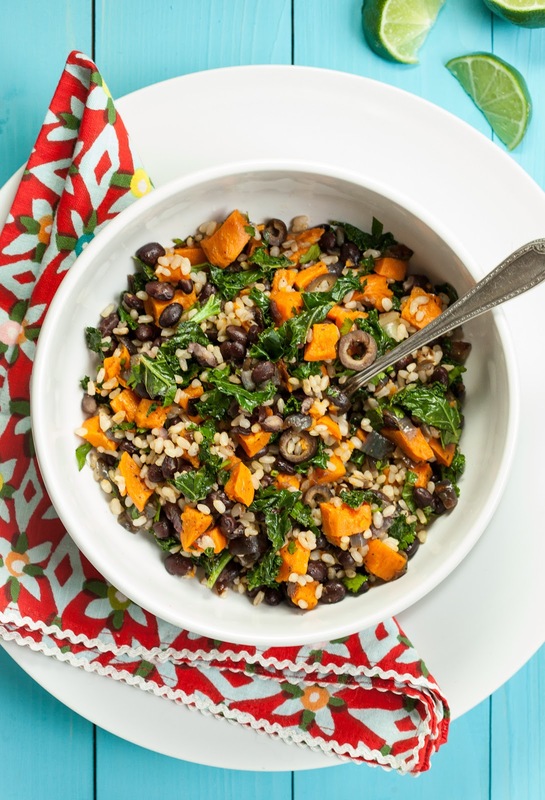 I believe that what I consider a "bean bowl" can deliver flavor in a way that is so satisfying that even age-old (or old-age) casserole enthusiasts might convert their ways. Perhaps bean bowls ARE updated casseroles? I'd like to think so. I know that over the years I've tended to view casseroles with a suspicious eye... wondering what lurked within their oft times indiscernible melee of ingredients. To be fair, I HAVE tasted many casseroles that I've truly enjoyed from a flavor perspective (even if I wasn't entirely sure what they were composed of) and I DO realize that much has evolved on the casserole front. I think many folks have figured out the benefits of eliminating (or substantially reducing) processed creams/cheeses and soups; realized we don't need bags of salty chips or canned onions crumbled over the top of perfectly good food; and, most importantly, recognized that vegetables don't need to be boiled or baked into total submission. And, I also realize that this bean bowl isn't really even in the casserole family (just in case anyone might wonder). Though parts of it are sautéed or oven-roasted, the actual mix comes together after all this cooking is done. Though, maybe... still... it can be considered a revamped casserole. A "beanbole." Like a casserole, the ingredients in this bean bowl all get mixed together. So, like a casserole, it's a one-dish meal (in the end). And, like a casserole, it's pretty quick and easy. Yet, unlike many casseroles, everything in this "one-dish" meal is readily identifiable. Black beans (yes, canned... typically Eden Food's Organic Black Beans that have been thoroughly drained and rinsed. I think these beans are quite tasty for canned and, in addition to being organically grown, are packaged in BPA-free cans); short-grain brown rice; sautéed kale; roasted sweet potato; roasted red onion; sliced black olives; a fresh chop of cilantro and a drizzle of fresh lime juice... in one bowl. It's a yummy, good-for-you one-dish beanbole. Preheat oven to 400 degrees F. Place sweet potato/yam on one-half of a large baking sheet, and red onion on the other half. Apportioned evenly, drizzle 2 tablespoons olive oil over top and sprinkle with approximately 1/2 teaspoon salt and 1/2 teaspoon pepper. With hands, gently toss each individually to mix through thoroughly, and arrange each in one layer to ensure even roasting. Note: dividing sweet potato/yam and red onion on baking sheet will allow you to remove red onion a bit before sweet potato/yam, if necessary. Roast for 30 minutes, until golden and cooked through (checking intermittently between 20 and 30 minutes, should red onion need to be removed early). Meanwhile, heat 1 tablespoon of olive oil in a large skillet over medium heat and add chopped kale. Season with salt and pepper, to taste (about 1/4 teaspoon each) and 1/4 teaspoon garlic powder. Sauté for approximately 3 to 5 minutes, until wilted and cooked through lightly. Transfer kale to a large bowl and allow to cool to room temperature. In the same skillet you prepared kale, heat 1 teaspoon olive oil over medium heat and add black beans. Season beans with salt and pepper, to taste (approximately 1/8 teaspoon of each) and 1/8 teaspoon garlic powder; heat through for about 2 minutes. Remove from heat and let cool to room temperature. 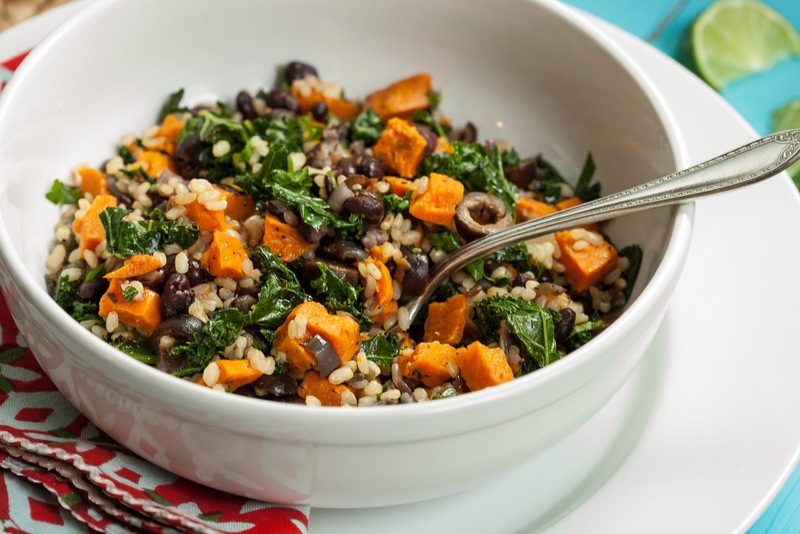 Add cooled bean mixture to bowl with sautéed kale, along with 1 to 2 cups cooked brown rice (as preferred), olives, and chopped cilantro; mix through to combine. Remove sweet potato/yam and red onion from oven. Let cool to room temperature and then add to bowl with bean mixture. Serve immediately with wedges of fresh lime to squeeze over top.